A small cottage tour industry has developed to showcase the region's architecture, mostly run by transplants from New York and Los Angeles who are not architects but have a keen interest in preservation and the area's unique design history. Palm Springs has been cited by the National Register of Historic Places for having the largest collection of mid-century modern architecture in the U.S., designed by such notables as Albert Frey, Howard Lapham, William F. Cody, William Krisel, Donald Wexler, Richard Neutra, and A. Quincy Jones among many others. These tours all a bit different. Some include interiors, others just exteriors; some last just 90 minutes, others take three hours. They are all led by passionate, knowledgeable local residents, who love the area and its many iconic residential and commercial buildings. One such is Michael Stern, who wrote Julius Shulman: Palm Springs (Rizzoli), chronicling the famous photographer's work in the area. On my tour, Stern pointed out some of the neighborhood's unique building regulations. "Notice the single-story zoning ordinance," he told our group. "No one can block your view, or look into your backyard. And there are no street lights so you can see the stars at night." Robert Imber is another. Originally from St. Louis, he's the dean of Palm Springs' architecture guides, having offered tours for over 10 years now. Yet another is tall and tanned Kurt Cyr, who designed department store interiors for the May Company before retiring to Palm Springs and starting his company, which offers the shortest tours, at just 90 minutes, of the bunch. "I think three hours is too long to sit in a car," he says, "and there's so many other things to do here people should get out and explore." Which is true. There are trails to hike and bike, Joshua Tree National Park to wander through, even cross country skiing (a recent visit found over two feet of snow atop Mount San Jacinto, reachable in 10 minutes by the Palm Springs Tramway). There are naturally fed hot springs, hot air balloon rides, and a BWM driving school where you can go as fast as you dare and learn to be a better driver. 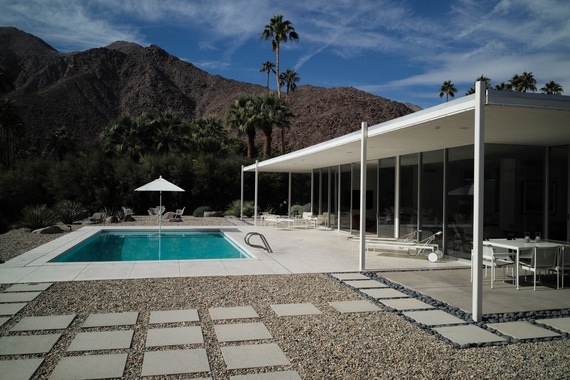 It's hard to choose which tour to take because they're all Palm Springs fabulous, but for my money I'd go with a tour that includes interiors, not just exterior views. PS Architecture Tours (psarchitecturetours.com; 323-578-6025; three-hour tours cost $85 per person, exteriors only). Palm Springs Mod Squad (psmodsquad.com, 760-469-9265). 90-minute "essential" tours cost $60 per person; interiors tour $120 per person. Palm Springs Modern Tours (palmspringsmoderntours.com; 760-318-6118). Three-hour tours cost $85 per person, exteriors only; cash or check only. The Modern Tour (themoderntour.com; 760-904-0904). 2.5-hour tours cost $150 per person and include several interiors.